The TANACOM 500 and 750 are unique in their sizing. They are much smaller than typical electric reels. The Compact Designs open up new avenues in how electric reels are utilized. Because of the reduced size and weight, the reels can be fished in the hand rather than in the rod holder. 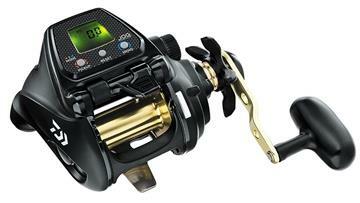 Both reels are Well Suited For Stand-Up Fishing Applications. Because they can fish lighter line, they are ideal for targeting tilefish, cod, halibut, lingcod or sand dabs. The TANACOM can also serve as a light kite reel. The reel is built around a stout Aluminum Frame that remains ridgid even under heavy sinkered loads. A Variable Speed Control allows real time adjustments to the fish retrieval speed. Instructions are printed in English, a small but important detail. A Rugged Power Cord keeps you connected. The quality of these reels is evident in the Model 500 which utilizes 6 ball bearings and a roller bearing and can exert 33-pounds of drag pressure.